The marketing world can be a dark and scary place if you don’t know much about it. Seeing how many types of marketing techniques exist, you might not know where to start. But do not worry, we have you covered. The key element for any marketing strategy is the customer. A great way to always keep your customer at the base of your marketing strategy, is to create a buyer persona for your business. That’s why filling in a persona canvas should be the first step you take - because everything you do afterwards will be related to it. The canvas will help you organize all the data you have available about customers and it’s a great asset all around (you'll see). Ideally, you will work with only one customer persona in the beginning. Yet, as your business evolves, you will probably identify more categories of consumers. But let’s not get ahead of ourselves. Let’s start at the beginning. A buyer persona is a detailed description of a business’s ideal buyer. You might find it under the name of “customer persona” or “marketing persona” as well. This semi-fictional portrait is based on past experiences with customers or created based on market research. A buyer persona should not be confused with a user persona, though (we know, way too many personas). A buyer persona is a portrayal of the person that pays for a product. Yet, that's not always the person that uses that product. That's called a user. So, naturally, a user persona is a portrayal of the person that uses the product. Sometimes, a single person can be both, sometimes they are different people. For instance, if a mom buys a toy, and her child plays with it - the mom is the buyer, while the child is the user. But, if you buy a coffee, and then drink it - then you are both the buyer and user. Makes sense, right? product development will know which features the clients will enjoy. Actually, product development is especially important. One of the basic principles in marketing is that you find out who your customers are, and then develop a product. Only then, you can offer a product based on their needs, wants and expectations. This is similar to what Eric Ries explains in The Lean Startup. So, why is creating marketing personas important for a startup? Because you don’t want to spend months, or even years, developing a product to only find out that no one wants to buy it. Now, you might say: “Well, then I’ll just do some research”. Of course! Market research is our hero to the rescue, but that’s only raw data. That's not enough! You need to use the data to find trends and segment your audience accordingly. This process is, basically, how you get personas. Developing a product used to be a shot in the dark. Well, think of a buyer persona as your metaphorical torch. It's a source full of information that will tell you what product your customers actually need. Now that you know why a buyer persona is useful, let’s talk about why we created a startup buyer persona. You will find many resources when it comes to personas - yup, everyone thinks they’re useful. Yet, we saw a lack of resources specifically for startup businesses. And to be honest, when you’re starting a company, that might be when you need a buyer persona template the most. 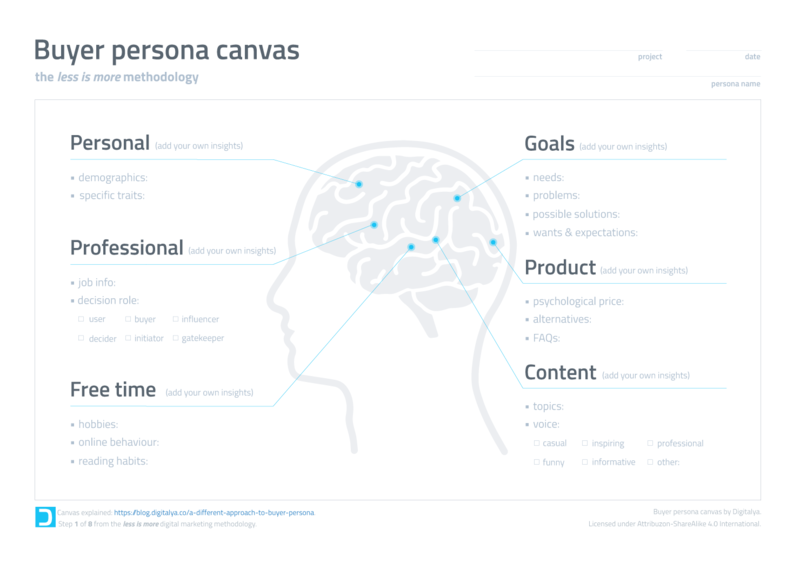 So we created a persona canvas based on research and our own experience. Before we get to the in-depth analysis of each section, you can have a look below at the entire buyer persona canvas. And if you already want to crack at it, you can download it here. Now, no more blabbering, let’s get down to business! Defining all of these aspects about your ideal buyer will help you empathize with him/her - the first step to creating targeted content. Knowing information like what your customers' daily struggles are, what they enjoy reading and what they want to know about your product or service will enable you to speak to your customers in a way that they will appreciate and share with others. Now that you know what the canvas consists of, let’s get to the nitty-gritty details of the buyer persona development process! We told you there was research! Note: We have to say research is a topic you could write a book on (seriously), and we can barely cover the surface in this article. We’ll write an article all about market research soon, so keep an eye out for that. If you want to be notified when it goes live, you can subscribe to our newsletter here. But in the meantime, let's talk about what the research for a customer persona should look like. There are so many methods out there, it can be overwhelming to figure out the right ones for you. So which ones do you choose? Well, there is no perfect recipe (not that we know of). However, we chose a few methods of research that are suited for a startup. After all, if you’re just starting a business, you have little to no data about past clients. That rules out quite a large number of research methods. Employees - they usually have experience in this line of work, and will probably offer a lot of intel. As you’ve seen, there’s quite a lot of information to add to a buyer persona canvas. So, we thought it would be helpful if we followed an example along each step. For this example, we imagined that we're a private health clinic. Our product is a wrist bracelet for heart monitoring, with metrics like blood pressure and heart rate. The bracelet is also connected to a mobile app for stats and advice. We identified as our main persona a man called David. Without further ado, let’s create a buyer persona together, shall we? We first cover our basics: buyer persona demographics. Specifically, we want to know the age, gender and location of our ideal buyer. This information is essential to learning what their needs and wants are for the product. The data also helps target the places where you actually will find your customer. For instance, you wouldn’t run an ad for a toolbox in a hair salon. That wouldn’t get a lot of customers, would it? Of course, not all products have only one persona design. However, it's better to create ads that people can relate to. An universal ad is rarely something all customers can relate to. Keep in mind, personalized marketing is the best marketing. We should write that on a t-shirt. The buyer persona specific traits section includes unique attributes and interests you discover about your customers. These outline their personality and character. Knowing these will make it easier to connect to your audience through content and customer service. You can use them in product development as well. How? Some traits might spark a need that your product can meet. Having data about their client's job is vital for B2B companies. But any business should have insight into their customer's professional life. The job info helps us understand our client better - what their passions are and what their career goals are. And how do we use this info? That's right - create content! You might have figured out the trend of this article - it's all about finding the right content for your audience. What is your target persona’s role in the decision-making unit (DMU) of their company? Gatekeeper - the person that controls the info exchanged between the DMU and the company. Any person could have a few of these roles at once, or each one at different times. You should establish here which role your persona usually takes on. Finding out the decision role, is yet again, most valuable to a B2B company’s persona development. Yet, knowing what role your persona is faced with on a day to day basis helps understand their professional struggles. So we'd argue it's valuable for a B2C business as well. “Okay, but how do I use that?” you might be wondering. Well, this information is a bridge between you and your client. You can connect with him or her through various forms, like writing an article on the topic. Or maybe using the topic to create an ad which he or she can relate to. Knowing your marketing persona's hobbies might not seem like a priority right now. But trust us, these buyer persona traits will come in handy at some point. You will probably make use of them for social media posts or advertising. They might play a major part in creating content as well. Creating a digital marketing strategy is already a complex process. If you don't know where your customers spend their time, that makes it 100 times harder. You might be sending emails to people that never check their email. Or creating Facebook ads when your audience is spending most of their time on Instagram. And that's just a waste of time and money. what tone of voice resonates with them. These are all key elements in a content marketing strategy. Get as specific as you can here, including blogs, books or publications they might like. An individual has a ton of needs, regarding different aspects. Your customer persona's needs should focus on those that will be satisfied by using your product/service. Marketers will always tell you: people don't buy products, they buy the benefits. So knowing the needs will help you better understand what you should be selling. The problems your clients face are the obstacles that keep them from achieving their goal. These challenges are the reason your business exists. They shape your product. You need to be the solution to the problems they face. As we said, you are the solution! Do you know what your persona’s needs are? Great! Then you should meet them! Whatever they lack, you offer. However, most needs have multiple solutions, so here you should iterate some solutions you could provide the customer with, based both on what problems they're faced with and on your own industry and business focus. Wants and expectations relate directly to your line of work and they'll help you give your customer a complete solution, with the appropriate features. Let's start with wants. In our day-to-day life, we don't really differentiate between needs and wants. I could say "I need a purple phone" or "I want to have lunch" and I would have it completely backwards. The truth is that having a certain feature to a product is a want, while eating is a physiological need. The need is the purpose of the customers while buying a product, while the wants are the path they take to reach that purpose. Next thing, we have expectations. What does my buyer persona expect from my product? Does he/she expect it to be cheap, expensive, made of a certain material, have a certain feature? Oh, the price! Maybe the most important piece of information for any business/startup owner. What amount is our marketing persona willing to pay? This is quite a difficult question, and if you don’t have past clients, it’s almost impossible to answer. You could look at your competitors to see what price they offer for their product. Or even ask employees about their knowledge. Still, the best option is to develop a survey. This is how you'll find out the amount your potential customers are willing to pay, which is not always equal to the market price. In marketing, this amount is called the psychological price. After all, your competitor might have a different customer profile. That means their price might not apply to your business. You don’t want to overprice, obviously. But you don’t want to sell your product cheaper than your customer’s psychological price, either. Remember when we told you about competition research? Did you look on your competitors’ social media and blog? Did you find any question about your product or industry? Did you find any that repeat themselves? Then hooray! You already found your persona’s frequently asked questions. If you didn’t find any, do not panic! You can consult forums and question-based websites (like Quora) for questions relevant to your business. These questions will help you create content that will not only be interesting for your readers, but actually helpful. You can start by researching what other solutions are available to solve their need. Then, based on the info you already had, figure out which ones they might go for. Or if you have a survey, you can save up a question for this topic. A survey will also show if customers are aware that they have other options, and how many they know about. Are you thinking: “My competitors, duh”? Hold your thought. It’s true, your direct competitors are a good alternative. Still, there almost always are some substitute solutions to the customer’s problem. Let’s discuss a simple example. You sell coffee. Your buyer persona’s problem is that they’re too sleepy. What solutions, other than coffee, can they choose? You see, there’s a lot they can do: drink a black tea, an energizing drink, a green smoothie or even go back to sleep. All these actions solve the problem of being sleepy. For starters, this information will reveal your indirect competition. It will also help you in writing a unique selling proposition to show why your product is the better choice. That’s what persona marketing is all about! We've repeated the word content 10 times before even getting to this step. That's a lot. But, obviously, it's important. By now, you found out your buyer persona’s specific traits, hobbies, reading habits and FAQs. All of these can help you figure out what topics your clients are interested in and you should write about. But keep in mind, a person can be interested in a lot of topics. Not all of them are relevant to your business. You need to find a complementary topic to your product, that will actually help with sales. For instance, if our product is a health-related smartwatch, we won’t talk about politics. Even though we found out David is interested in this topic. We will rather talk about the health benefits of camping. This relates to our business, but also his love for going on holidays with his family. The voice is an important piece in the persona marketing puzzle. It needs to transcend all media and not only appeal to your customers, but be true to your brand identity. You will use this voice for your blog articles, social media posts, emails and so on. You can even say it goes hand in hand with branding. Anyway, what we're trying to say is that it's a difficult thing to change. Related to the customer persona, take a look at what your buyer likes to read, how is that content written? Do they have a casual or formal approach? Is it funny, sad or impersonal? Whichever one it is, that’s probably the writing style they would enjoy when reading your content as well. However, you also have to stay true to your values. So the voice you create for your business should balance between the two. If you want to have a reference when you create your own, you can download our free buyer persona example here. So here you have it: a complete guide to creating buyer personas for startups! We hope we covered all the buyer persona benefits for your startup. develop a long-term relationship with your clients. We’re sure there’s quite a few that we don’t even know about! Phew, that was a long article! Congrats to you for sticking around until the end! P.S. : This is the first article from a series of guides for kickstarting a business, so if you enjoyed this one, subscribe to our newsletter to find out when the next ones go up.